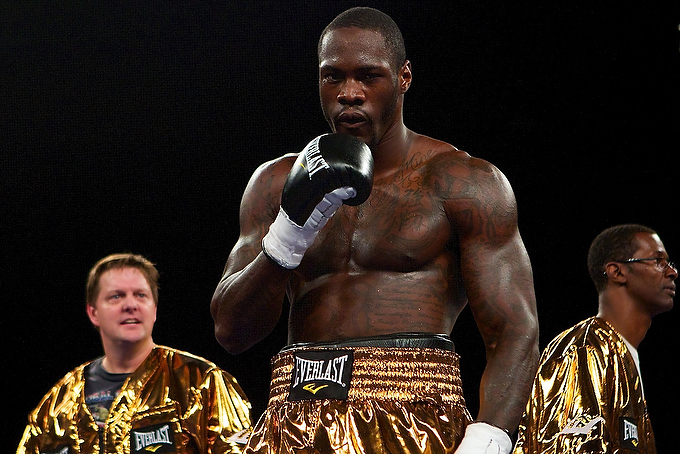 It’s a pretty good time to be a fan of Deontay Wilder. Wilder, the WBC heavyweight champion of the world, is on a hot streak, as he is coming off an electric, 1st-round knockout over former champion Bermane Stiverne in their rematch last month inside of Barclays Center. Wilder turned professional in 2008 and he has carved out an impressive 39-0 record with 38 knockouts to his credit. There seems to be no bigger fight to make in the sport of boxing than Wilder facing off with IBF/WBA champion Anthony Joshua, and here’s hoping that we can see it made next year or even in 2019. With so much interest in an Anthony Joshua match, we decided to look at some of Deontay Wilder’s best opponents to date. Don’t let Wilder’s first-round destruction of Stiverne fool you, the Haitian-born prizefighter is as tough as nails and packs a big punch. All one must do is flash back to Stiverne’s pair of victories over Chris Arreola, especially in the rematch, where he scored a sixth round TKO victory, to see the kind of fighter Stiverne is. Speaking off Arreola, not too many years ago it was he who was regarded as one of the top heavyweights in the world coming up. Arreola made big noise coming out of Southern California and was often featured on HBO, as he scored victories over the likes of Chazz Witherspoon, Travis Walker, Jameel McCline and Brian Minto, while coming up short against Tomasz Adamek and Vitali Klitschko. Arreola can box a little bit for a big guy and he is never afraid to put his neck on the line. Arreola was 35 and past his best when he met Wilder, but still a fighter with plenty of top-flight experience. Wilder handled him relatively easy, scoring a one-sided TKO after the eighth round. Gerald Washington suffered a 5th round TKO loss to Deontay Wilder inside of fhe Legacy Arena in Birmingham, Al. on Feb. 25 of this year. Despite that defeat, the first of his career, Washington, from San Jose, Calif., had defeated some decent names such as Travis Walker, Nagy Aguilera, Ray Austin, and Eddie Chambers, as well as having fought the respected Amir Mansour to a split-draw. Washington may need to go back to the drawing board himself, however, as he is coming off another TKO loss, this time at the hands of fast-rising prospect Jarrell “Big Baby” Miller this past July 29 in Brooklyn. Eric Molina may not get a lot of credit in the heavyweight division, but there’s no denying he is a tough customer. Outside of a first-round knockout loss in his pro debut, and another 1st round TKO loss years later to Chris Arreola, he has showed up to fight. Molina scored victories over the likes of DaVarryl Williamson, Tomasz Adamek, and Tony Grano during his ten years as a pro. Not bad for a man many labeled a journeyman. Artur Szpilka is a tough fighter from Wieliczka, Poland. He is the type of fighter that nobody should take lightly, having scored victories over Brian Minto, Mike Mollo, and Manuel Quezada. Wilder didn’t take Szpilka for granted, as he controlled their bout and scored a ninth-round TKO victory inside of the Barclays Center in Brooklyn, New York in January of 2016.